Four years and 3,200 million kilometers ago, JAXA ( Japan Aerospace Exploration Agency ) launched Hayabusa2, a sample return mission targeting asteroid 162173 Ryugu. Hayabusa2 found Ryugu on June 27, 2018. For several weeks Hayabusa hovered 20 kilometers above tiny Ryugu in anticipation of deploying two diminutive 18 centimeter diameter rovers. On September 22 JAXA mission control cheered when rovers 1A and 1B dutifully hopped across the surface of Ryugu. 17 minutes later first images of Ryugu found their way home. Hayabusa2 plans to crash impact rover MASCOT ( Mobile Asteroid Surface Scout ) to form a crater on Ryugu’s surface. Before embarking on the journey home in December 2019, Hayabusa2 will land on Ryugu to retrieve rover MASCOT, returning to Earth in 2020 with samples collected from a 1 kilometer wide asteroid 313 million kilometers away. 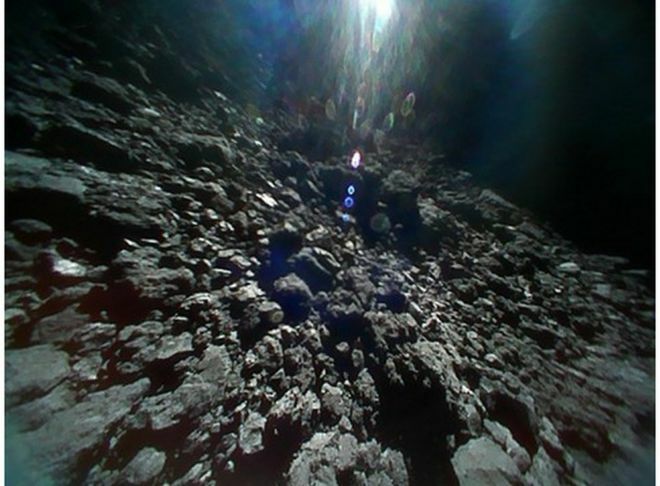 Ponder sunrise over Ryugu, cosmic wonder captured by a space agency and mission few people knew existed. Inspired by Digital Universe Atlas ( definitive four dimensional map of our universe maintained by astrophysicists at the American Museum of Natural History ) the museum created The Known Universe, part of their 2009 exhibit Visions of the Cosmos. Sunday night Hubble – no need for words….